Keeping up with large family living without forgetting anything can be a challenge. These simple to do lists will keep you running like an Olympian. This time it was a note that one of our games was rescheduled for this Thursday. Which was good, I guess. We needed to get these games in! But it also meant that we now had to be in four different locations at the same time. Yikes! It’s hard to keep track of everyone’s schedule, especially once your kids are school aged. Everyone has products due, places to be, and it’s never easy to remember to schedule appointments and meetings. Most Moms can’t keep it all together without some type of system in place. When I was young, my own mom kept track of our big family with a wall calendar. She would color code our schedules so she knew at a glance which of the five kids had to be where. Over time, I’ve learned that keeping up with five kids and a husband requires a certain amount of organization. And I’ve streamlined most of our daily lives into a list–make that four lists!–that keep things flowing smoothly. Don’t worry, it’s not as big a deal as that sounds! Read on to see how to keep it simple (sweetie!). The family calendar has to be the number one way I keep life in check. If it weren’t for that, I’d never know what direction I’d be headed in! I keep a color coded calendar (don’t worry, no highlighter caps were pulled in the making of this calendar!). The minute you get a schedule or calendar of events from a teacher or leader, sit down and plug it in. This goes for school, ball schedules, church events, family birthdays and celebrations, appointments, meetings, and whatever else life throws your way. Yeah, you could hang the schedule on the fridge and hope for the best. But you know it’s going to be buried under artwork by the kids… or flung from the magnet when a wild wind blows by (do your kids play tag in the kitchen, too?). I love that you can see at a glance what your day or week looks like! Creating a list for each day of the week can help you regain some sanity! Decide the tasks you have to do every day to keep things running (for me, that’s empty the dishwasher, make the bed, start laundry, figure out what’s for supper). Then, figure out what can be done less often. Maybe Mondays can be for jobs like taking out the trash in less often used cans, and baking something for breakfast or lunches. Be sure to add fun to your lists, too. If you’re not very good at building fun things into your day without a nudge, add “read a chapter of my book” or “do my nails” to the list, too. Don’t you just love running out of something the day after you go shopping? Neither do I. I used to have scraps of paper everywhere with short lists of things I needed to remember to grab the next time I went out. But when I’d go to the store, did I remember to collect my scraps of paper first? Haha!! Of course not. That’s why I was excited to find a shopping list option on my free Cozi app! With Cozi, when you run out of something you can immediately add it to the list on your phone. Check on your list when you hit the store next. Or, better yet… tell your Hubby to check the list from his phone! He can stop for a few things on his way home, too. I hate meal planning, but I hate not having a plan even more. Deciding what to eat every single day gets annoying, so I try to keep a list of meals I can put together based on what I have on hand. Keep a list on hand of your family’s favorites. That keeps you from scouring Pinterest for recipes that you actually have the ingredients for! How Do I Juggle It All? Like I said, I used to use scraps of paper or I’d make notes on whatever I had handy. You can imagine how that worked out. It was a relief when I learned about Cozi. I started using this free family organizer on my home computer nearly a decade ago! And I’d be lost without it. Once I finally decided to upgrade to a smartphone last year, the free Cozi app was one of the first things I loaded. Let me tell you why I love Cozi and can’t imagine doing without it! It color codes everything and makes this hot mess Mama feel like Monica from Friends (even though I’m never that organized!). My to do list is always there waiting for me. Next Monday, I’ll just uncheck everything on my Monday list and start again. I can even rearrange things on the list to show my priorities for this week! No reason to reinvent the wheel, right? The running grocery list is simple to add to. And Hubby can add to it whenever he needs things without trying to remember to tell me first! The meal plan section is amazing. You can plug in the recipes you use most often and it saves them. Then drag and drop the ones you want to use this week. You’ll have the ingredients you need at a glance. It totally makes me hate meal planning way less. Did I mention it’s FREE? That makes Cozi #yearofno approved! 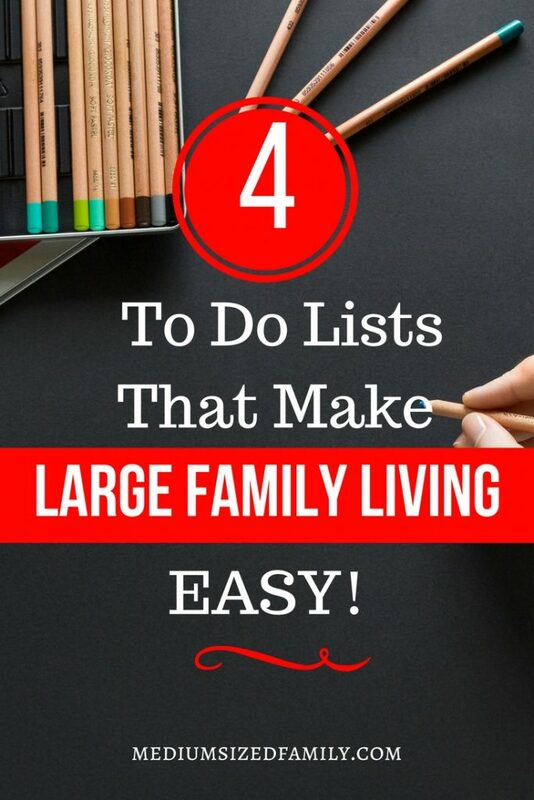 With these lists in hand, you’ll thrive at large family living! It’s not always fun to try to get four kids to four different locations at once. But since I knew it was coming, I was able to schedule rides for everyone ahead of time! I think you’ll find life more manageable with this awesome family organizer no matter how many kids you have. What’s important to keep on your daily to do lists? My to do list feels never ending, and I bet yours does, too! I run my family of 7 more smoothly when I keep up with these 4 lists every day.